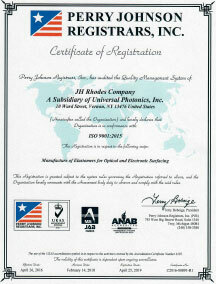 JH Rhodes ISO 9001:2015 certification recognized by these international accreditation organizations through Perry Johnson Registrars, Inc.
Our JH Rhodes manufacturing facility underscores our “Yes We Can” commitment to quality and continuous improvement. 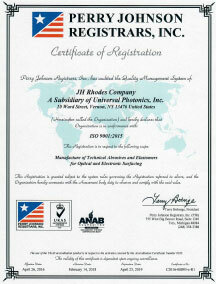 Internationally recognized for compliance with ISO 9001:2015 standards, JH Rhodes is not only the primary manufacturing center for much of our signature polishing materials, but a virtual think-tank of R&D, assuring ongoing technological advancements. Whether supplying products to polish the Hubble Telescope or for producing computer chips, the world‘s largest corporations lead their markets with Universal Photonics‘ high performance products.